How 'live' is the live stream? UPDATED: Sky Player on Xbox has arrived,- now read our full Sky Player on Xbox review. Representing Sky's move onto a gaming console for the first time, for Sky satellite subscribers the Xbox brings true on demand to their television and for other people the chance to get movies, entertainment and sports onto their television without a satellite installation. So TechRadar has pinned down the likes of Sky's Director of On Demand Griff Parry, Xbox's Jerry Johnson and Neil Thompson and Adrian Pilkington of BSkyB to ask just what the service is. 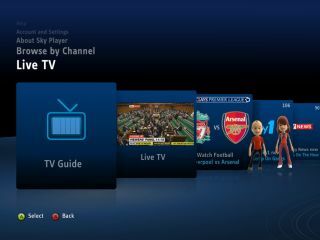 When is Sky Player for Xbox 360 arriving and how much will it cost? The UK release date for Sky Player for Xbox 360 is 27 October – The ad campaign has already started in earnest. "To watch Sky Player on Xbox 360, customers will need an Xbox LIVE Gold membership," explains Sky. "Non–Sky satellite customers will also require a monthly subscription which starts at £15 per month to Sky Player's Base Entertainment Pack. Customers who want to watch Sky Sports 1, 2, 3 and Xtra, ESPN and the Sky Movies channels will be able to add these channels to their Base Entertainment Pack for an additional cost. In addition to the live channels, customers will also have access to on-demand programmes from channels they subscribe to. "Existing Sky customers with Xbox Live Gold membership will be able to access Sky Player's on-demand content in line with the channels they are able to access through their core Sky TV subscription. Customers with Sky Multiroom or Sky Broadband Unlimited subscriptions are additionally able to access live channels for no extra charge." How fast will my broadband connection have to be to be able to watch Sky player? Xbox Live Product Unit Manager Jerry Johnson: "Right now the minimum requirements are minimum 1Mb connection with a suggestion of 2Mb to get an optimal experience of that. When we see the continued penetration of higher and higher connection then that may change. "We are continuing to work with Sky to enhance that experience using the various technologies that are available." The lowest quality streams at 600Kbps, the medium at 1.1Mbps and the best quality at 1.8Mbps. Next Page How 'live' is the live stream?